Every month I share how much money I make online with you. Why? For a couple reasons. First, I want to inspire others by showing them people can make a living by working online from the comfort, and sometimes chaos, of your own home. Second, I use these online income reports as a way to keep myself accountable to my online income goals. The accountability is even more important now that my wife no longer works a full time job and now spends most of her time at home with my son and I. Before we dive into the May 2018 income numbers, I want to share something I learned about self-employment in May that could help you should you ever decide to make the leap. May was a tougher than normal month for a couple reasons which taught me a key lesson about self-employment. The lesson is you should never get too comfortable. Being comfortable usually means you aren’t growing and pushing your boundaries, but it can also get dangerous when some of the not so great parts of self-employment pop up. In May, my wife made the jump to working just a couple days per month at her job which is awesome. Of course, May is also the month where something bad happened financially for my business. Sadly, one of my largest clients no longer needed me to write for them at the beginning of May. It wasn’t that they didn’t like my work. Instead, they were restructuring their business. This happens more often than you may realize. April was one of my better income months in a while, so I was getting comfortable with my current workload and wasn’t looking for any new work. I now know that was a mistake. From now on, I’ll always be looking to tweak my workload by adding new clients that are the right fit. I’ll also keep a list of potential clients ready should I ever need to add a new client quickly if my projected income looks like it will be too low. May was a month of hustling to replace the income I lost from one of my biggest clients to make sure I could hit my new income goal of $5,100 per month. 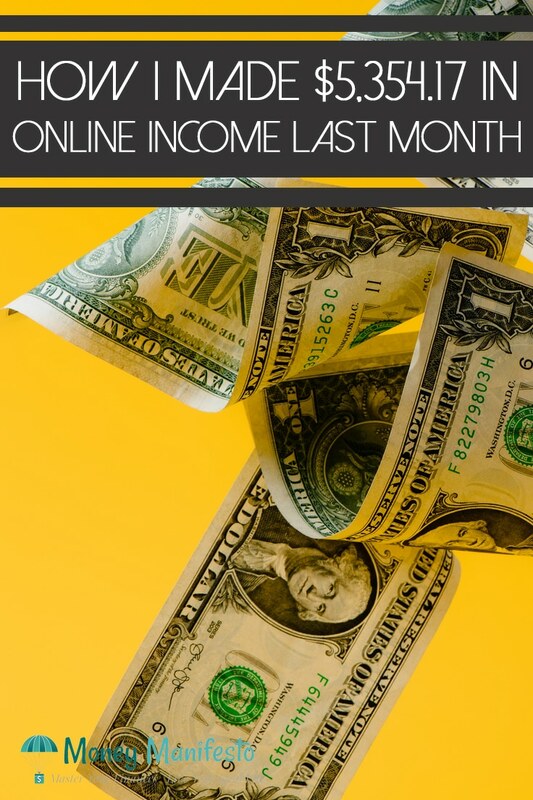 In May 2018, I squeaked out the first month where I beat my higher income goal of $5,100. I ended up earning $5,354.17. Here’s how that income broke down. Even with the loss of one of my biggest freelance writing clients, I still earn a majority of my income from my writing for other websites. I used to just want a few clients to keep things easier for myself. However, I’ve decided it’s time to make sure I have enough sources of freelance writing income so if I lose a client or two due to circumstance beyond my control it won’t put me at risk of not hitting my minimum income goal of $5,100 per month. Thankfully, I was able to hustle this month and find a new client by the end of May along with a few more potential clients that I could start writing for in June. Additionally, I reached out to my current clients and picked up a bit of extra work that enabled me to reach my monthly income goal. Without a bit of extra hustling, I definitely wouldn’t have hit my $5,100 goal. If you want to learn about how you can start earning money by writing for others, you should definitely check out Holly Johnson’s Earn More Writing course. She earns over $200,000 per year writing and shares how she does it in her course. I found a few helpful tips that increased my income after taking the course. You can sign up for the course here or read my Earn More Writing review here. Traditional advertising, which are the banner ads you see on my site, finally reached a temporary peak since I switched to Mediavine late last year. May was a lower traffic month for my site thanks to the typical summer slow down that impacts many blogs and directly affects advertising income. April 2018 was my best income month as far as traditional ads go and May 2018 dipped just a little bit. Still, I’m in love with Mediavine and the much higher ad revenue they bring in than my old traditional advertisers did. I say a temporary peak because I anticipate my income from ads will increase as we move later in the year. I also hope to grow my traffic more in future months. If you’re a blogger with more than 25,000 monthly sessions, you need to seriously consider making a switch to Mediavine. You’ll be glad you did. May was a decent month for affiliate income, but I’m only earning a small portion of my income from affiliate marketing. Never heard of affiliate marketing? You aren’t alone. Essentially, companies pay me to send people their way and make a purchase. If a person clicks on an affiliate link, a fancy name for a link that tells a company I sent you, and they make a purchase, I’ll get a commission for that purchase. The best part is, you get the same prices whether you click on my link or not while I get a bit of money to help support my family and my site. For instance, if you click on one of my Republic Wireless links after reading my Republic Wireless review and set up a new phone line with them, I’ll get a commission. This month, I added a new affiliate partnership with Nectar Sleep, a company that sells mattresses online. More on that in the next section. This month I had a new branded content opportunity. When it comes to most branded content opportunities, companies usually pay for a placement on my blog or in one of my blog posts to get additional exposure for their brand. In addition to the other branded content opportunities I take advantage of, this month I reached out to Nectar mattress. I wanted to test out a mattress you order online to see if it’s a good deal or not. Nectar offered to send me a free King size mattress in exchange for an honest review. I jumped at the opportunity since we needed a new mattress and they cost several hundred dollars. Make sure to check out my Nectar mattress review if you’re in need of a new mattress. If you end up buying a Nectar mattress through one of the links in the review, it is an affiliate link which means I’ll get a commission for sending you their way. Now that you can see there are tons of ways to earn money online, you may be wondering how to start your own blog or website. I’ve put together a step by step guide that shows you how to start a self-hosted WordPress blog using SiteGround. I’ll share the link in just a minute. Personally, my blog is a self-hosted WordPress blog and I wouldn’t recommend any other platform. WordPress is key because it’s a widely used and highly customizable website building solution that’s great for blogging and portfolio websites. Self-hosted is also key because it means you’re in complete control and own your website, unlike with many free blogging options. Starting a blog can be the beginning to your journey to working online and becoming self-employed like I am or it could just be a fun way to earn a few extra hundred dollars each month. You don’t have to start a blog, either. If you have a small business in your community or want to start one, you can set up a website to help grow your business. Websites are great portfolios for freelancers, too. Freelance photographers and freelance writers can post their work on their websites for potential clients to see. If you’re ready to get started, make sure to check out my step by step guide on how to start a self-hosted WordPress blog on SiteGround. Let me know if you have any questions about my income reports or how to start your own blog or website in the comments below or by contacting me. I’d be happy to answer them.